SaraH is a 17-year-old Japanese high school student who we often see around the streets of Harajuku. 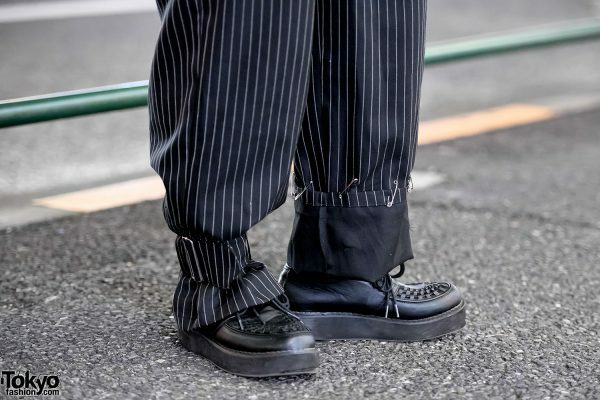 Her look here features a belted 1980s pinstripe blazer with shoulder pads from Kakavaka Tokyo worn off the shoulder over a black lace top from Nadia Harajuku, Faith Tokyo pinstripe pants with safety pins and a buckle on the hems, and Yosuke platform creepers. SaraH’s belt is from the Tokyo vintage shop Flamingo and she’s also wearing a hat. Follow SaraH on Instagram for more of her personal street style.